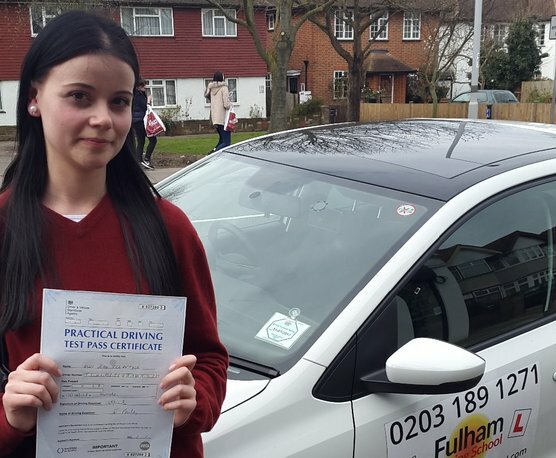 "I have just found out that learning to drive can be fun, challenging and very rewarding. So, choosing the best driving school is important. In Fulham Driver School, I found an Instructor (Slave) that brought both patience and professionalism to our driving sessions. Highly recommended." "Just passed my driving test in Morden with Slav. Before the lessons I was scared and was not that that confident to drive Slav gave me the confidence and motivation and made my lessons enjoyable. Thank you for that." "Thank you again for helping me pass my driving test, you are a very good instructor and I really liked how you taught me the rules and way to drive and be safe. I will always recommend you to people who are looking for a instructor. Your skills and way of training made me pass my test quickly but still made me be safe and learn the rules and skills to drive." 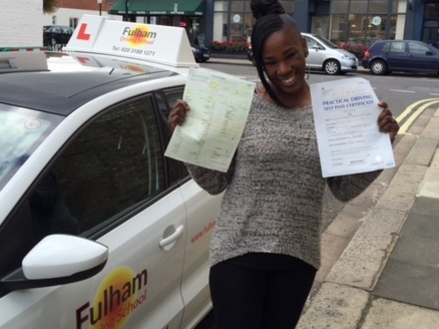 "When I contacted Fulham Driving School with the hope of doing an intensive course, Vinney was very informative and helped me to plan out a programme of lessons that would suit me. He was flexible throughout my lessons, adjusting the schedule and his approach to suit how I was learning. 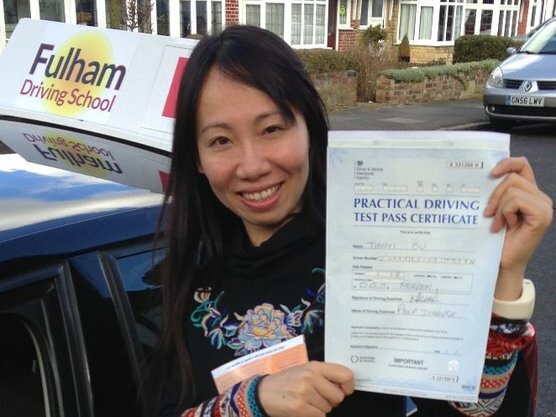 I passed first time after less than 25hrs tuition and Vinney has given me the confidence, not just to pass the test, but also to be a good, safe driver. I had a great time learning to drive with Vinney and would recommend him very highly." 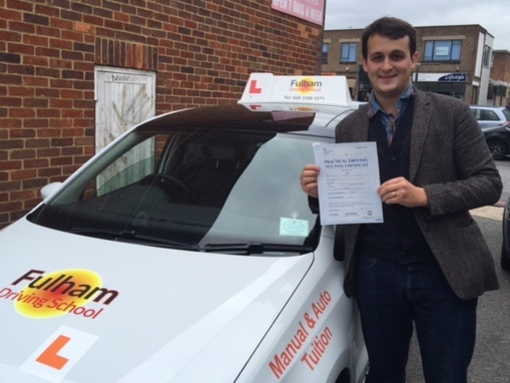 "Vinney and Graham were both excellent instructors when I had to pass my driving test for work. They understood exactly where I was going wrong and helped me iron out any bad driving habits that I had. I had to get my test done within a short space of time and they both made sure that they would make time to fit me in. Both very relaxed and friendly guys! Thank you for all your help!" "Vinney is a fantastic instructor - I cannot recommend him more highly. I've had bad experiences in the past, and so really saw the difference that having a great instructor can make. Not only is he fun to be in the car with, but importantly he is patient and really knows when you need to focus on a particular area. His feedback was always very clear. 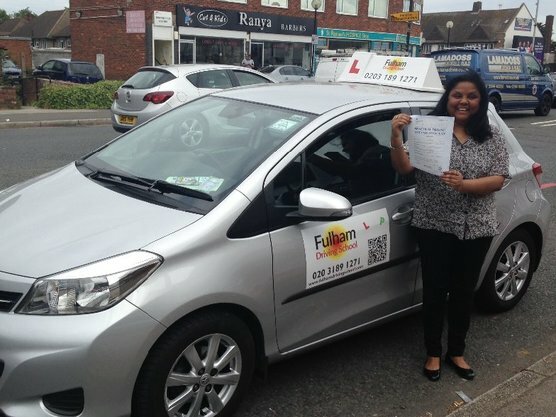 I was under pressure to quickly learn to drive and to pass my test, and I would not have been able to do so without Vinney. Thanks for everything!" 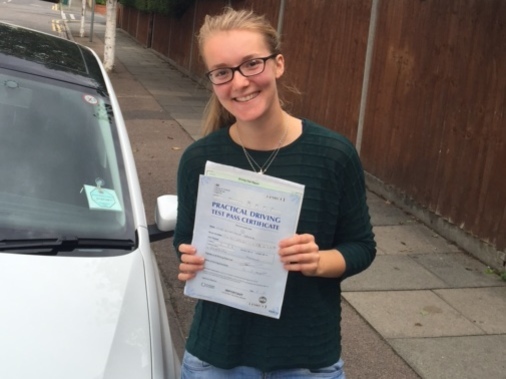 "I would like to say a big thank you to Vinney, he has been truly amazing when it came to teaching me to drive. Not only has he given me the skills to pass my test but he gave me the skills to drive safe for life. I really hope everyone learning to drive has an instructor like Vinney' as he is able to keep you safe and confident and he has the ability to let you enjoy driving. Thank you Vinney for helping me pass first time and giving me the skills to drive safe for life. 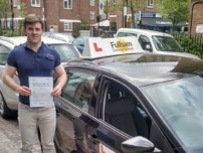 I would strongly recommend Fulham Driving School to anyone wanting to pass their test with wisdom and confidence and cross your fingers an hope Vinney is sitting in the car waiting to teach you. A massive Thank You again Vinney." 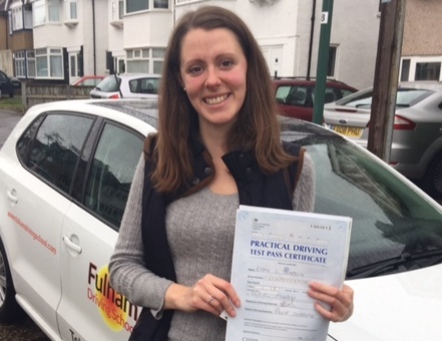 "There are many Driving Schools in my area and I carried out extensive research before I decided to take my lessons with Fulham Driving School. Undoubtedly, this school really has and offers what it takes to become a good driver and pass your practical driving test at the first attempt. Thanks to my instructor Goce, I passed my test at the first attempt. He is very patient, confident, punctual and has the necessary knowledge, good driving teaching skills, driving experience and other qualities to help you pass the driving test and improve safe driving skills." 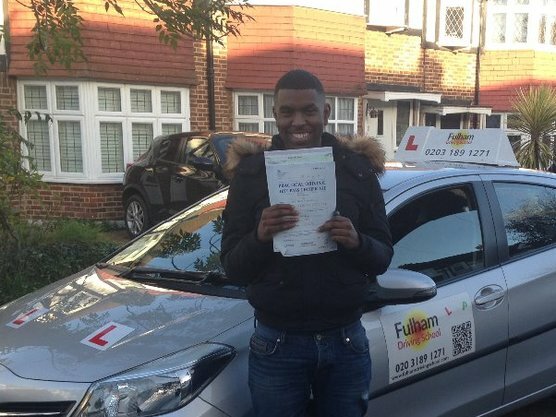 "Choosing to take my lessons with Fulham Driving School was one of the best decisions I've made all Summer! The instructors were extremely informative and put lots of time and dedication into explaining effective ways of improving my driving ability. I enjoyed every lesson and could feel my confidence improving hour by hour. 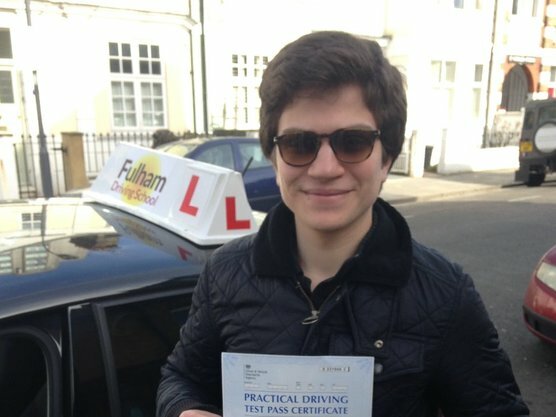 For anyone looking to pass their test, I would fully recommend Fulham Driving School to get the most out of each lesson you take. The instructors support you from start to finish and are always prepared to listen and help you improve in a way that suits you best." 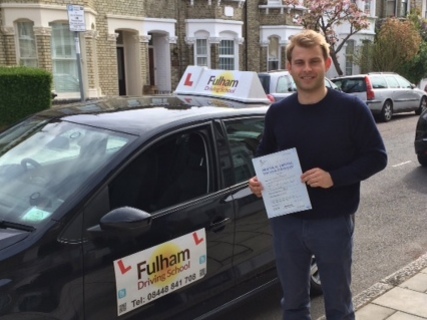 "Thanks to Graham's patience,understanding and his ability to pass his knowledge onto his pupils I passed my driving test first time. Because of this I went on to do Pass plus with him which increased my knowledge to make me a better and safer driver. Thanks Graham." "Massive thanks to Slav. He is a great Instructor, makes you feel really at ease, supportive and great at boosting confidence. I was able to pass !!! A flawless teacher and a great friend. 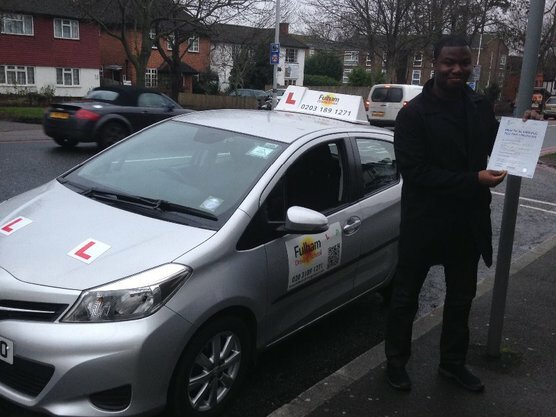 I had a great time with Fulham driving School." "Many thanks for all your help over the past few weeks, I've really enjoyed our lessons and your excellent tips and advice made the test appear less daunting than I first imagined. After our lessons I felt confident going into the practical test and I came out with a pass at the first attempt. I would highly recommend the Fulham Driving School, and Goce in particular, to anyone who is thinking about learning to drive." 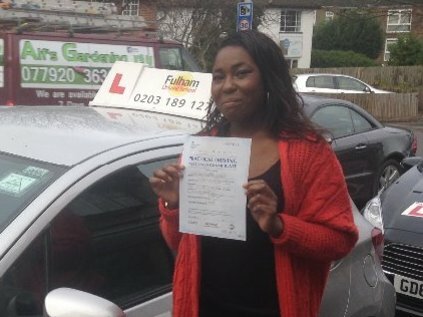 "I had a very great experience with Fulham Driving School. I had lessons with Goce for 10 hours and he helped me to gain confidence on passing the test first time. He is strict but its okay because I learned how to drive safely and properly. Passing the test is one of the best feelings. I'd totally recommend Fulham Driving School and Goce." "Goce was a great driving instructor. He was patient and attentive, pointing out my mistakes in order for me to progress quicker. He related driving situations during our lessons to what it would be like on the test so that I would know what to expect and therefore how to react. On his advice I only had 20 lessons and I was able to pass the test on my first attempt. I would definitely recommend Goce. " 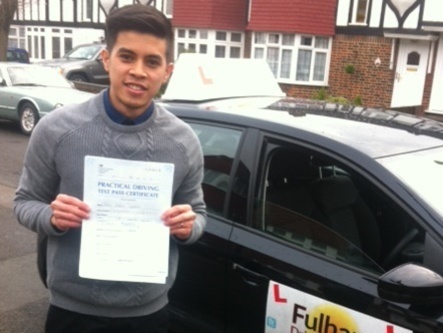 "I am extremely grateful to Vinney from the Fulham Driving School who helped me pass my driving test! He made me aware of my errors and gave me great feedback during my lessons which helped me to understand my actions on the road. He is very patient and has amazing teaching skills which puts him ahead of all the other instructors out there, if only there were more teachers like him! I am very pleased that I passed my driving test today and I thoroughly recommend Fulham Driving School to everyone who wants to pass their test first time! Thanks again Vinney!" 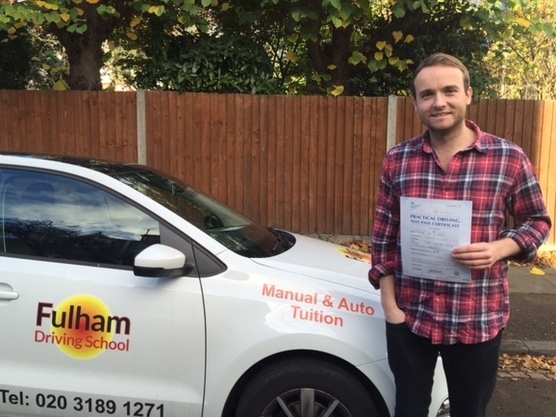 "I passed my test on the first attempt, thanks to Graham. He is the best instructor: calm, patient and very nice. He did not only teach me how to pass the test, but helped me to feel secure and be a good driver. Thank you very much!"